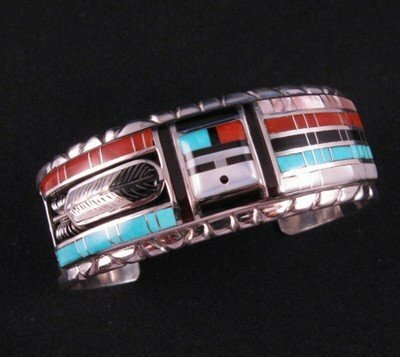 Top quality contemporary Zuni Sunface spinner bracelet, created by Zuni great, Don Dewa. The bracelet is inlaid with the finest Coral, Sleeping Beauty Turquoise, Mother of Pearl, Onyx, and pink shell. There is a square sunface in the center and a fancy etched inlaid feather on one side. Any reflection or shaded spots are due to photography - this is a perfect piece. 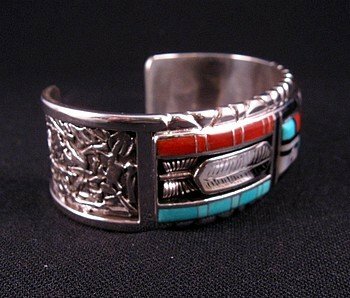 The bracelet measures 7/8 wide with an inside end-to-end measurement of 5-3/8 plus a non-adjustable opening gap of 1-3/8. The bracelet weighs 52.4 grams. Stamped with Don Dewa's fancy sunface hallmark. Brand new and in perfect condition. Gift box and Certificate of Authenticity included with your purchase. 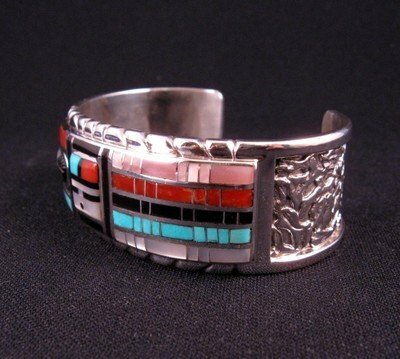 Don't miss out on this unique piece of beautiful Indian jewelry. 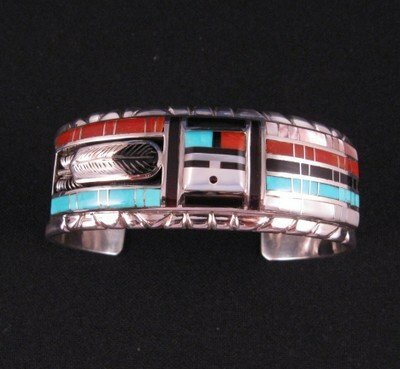 Don Dewa began making jewelry in 1970, and by the early 1990s he started to produce mosaic inlay, having learned it from his mother-in-law, Loretta Quam Eriacho. He has become an absolute master at mosaic and channel inlay, and one of Don's most innovative and distinctive designs is his sunface spinner rings, pendants and bracelets, which are also for sale on our website. Enter DEWA in the search box.